Our fifth generation dairy and maple farm! 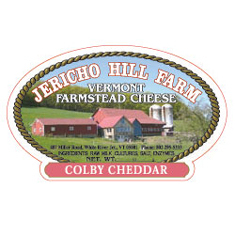 Jericho Hill Farm is owned and operated by George and Linda Miller. Our lovely hillside farm has been in the Miller family since November of 1907 when George Nelson Miller walked up Jericho Hill from the White River Jct. train depot and bought the farm with a handshake and $1,800 secretly sewn into the lining of his jacket. Great Grandpa George peddled butter, potatoes, and apples to the townspeople and stores in Hartford. Later his son, Chester with wife Hazel at his side, took over the farm and continued this tradition, expanding into selling maple syrup as well as cream and milk. In 1956 Chet and Hazel bought a second farm in the Jericho District which they eventually sold to their son, Raymond, and daughter-in-law Joyce. 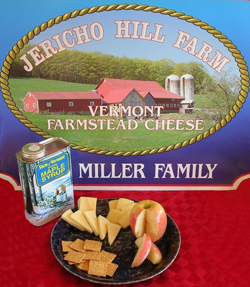 Ray and Joyce along with their son, George, began shipping milk in 1976 for Cabot Cheese from Jericho ValVu Farm. At the same time George started an award-winning maple syrup partnership known as Scattered Maples, 1994 Winner of the Vermont Maplerama “World’s Best Maple Syrup Award”. We’ve come full circle and are now peddling our maple and dairy products directly to our consumers at local Farmers Markets and country stores just as Great Grandpa Miller did those many years ago. We hope that you try our delicious maple syrup and taste our amazing Smoked, Pepper Caraway, and Jericho Jack cheeses as well as our Colby Cheddar…and please visit our sugarhouse in the Spring! A raw milk, farmstead cheddar cheese which is made in the stirred curd style. This cheese is a mild cheddar with a smooth, creamy texture. An aged, raw milk, salt water brined, farmstead cheese with a firm body and soft, smooth texture. We age our 1 lb., 4 inch, 8 inch and 10 inch wheels for 60 days and beyond. We have also created deliciousPepper Jack and Smoked Jack cheeses.